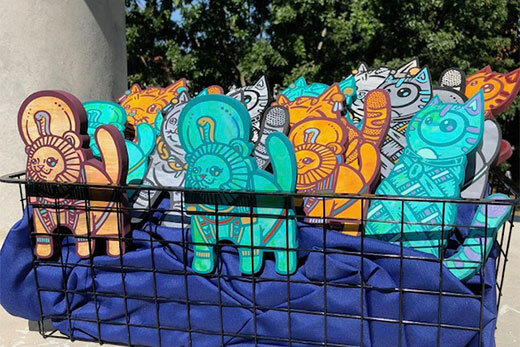 Street artist Catlanta created custom #Carloscats for the “Divine Felines: Cats of Ancient Egypt” exhibition at Emory’s Carlos Museum. Search for the wooden kitties around campus through Friday and see the exhibit by Nov. 11. #Carloscats are ambassadors of “Divine Felines: Cats of Ancient Egypt,” an exhibit organized by the Brooklyn Museum and on view at Emory’s Michael C. Carlos Museum through Nov. 11, and they want to teach Emory students, faculty and staff about the importance of cats (and dogs!) in ancient Egypt. The museum has a history of working with local artists and businesses in support of its educational programs, and with “Divine Felines” and the enthusiasm for #Dooleycat, Atlanta street artist Catlanta was a clear choice for collaboration. For years, Atlantans have followed Catlanta’s accounts on Instagram, Twitter and Facebook for clues to where to find his handmade wooden kitties hidden around the city, while his custom Dooleycats have been placed around Emory during Dooley’s Week. After visiting the “Divine Felines” exhibition, Catlanta created three different Egyptian-themed cats. At the end of June, five cats were released across Atlanta in locations like Oakland Cemetery and Freedom Park to popular acclaim (Catlanta reports that they were some of his most popular kittens to date). With assistance from Campus Life, the museum will release a total of 15 #carloscats (five of each design, but each with a unique paint job) this week. Locations are top secret, but visitors to “Divine Felines” may have some additional insight, as all of the clues are derived from facts shared in the exhibition (located on level three and a few steps away from the newly opened Ebrik Coffee Room!). You can also visit Emory Campus Life on Instagram for clues. The Catlanta scavenger hunt continues around campus through Friday.